To hit an opponent slide the finger in the direction. To block the opponents strike, hold on the button block. 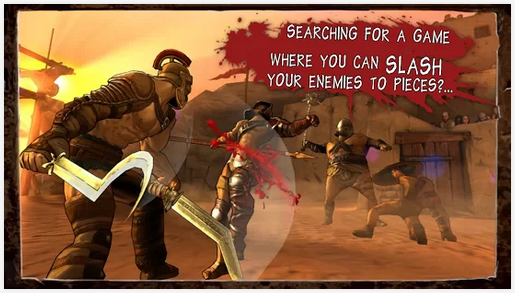 Perform attacks from different directions to break through defense and be able to stun your opponent. The stars above the head mean that you are able to stun the opponent. Slide your finger up or down to stun him. To deliver a power strike, press and hold on your finger, pressed as long as possible and then release. Out of the combat, press the button "Run" to move in the arena. Slide the second finger on the screen to change the direction of running. Deal with the rest of the opponents! to attack an opponent, just click on him. Your glory level is depicted on the indicator, press this button to greet spectators and maybe you will get a bonus. Move to the highlighted green area to continue. The sign warns that the opponent is going to make an unblockable strike. You can try to dodge it by holding block button and moving finger right or left. You can buy potions and rent strong weapons from my booth during combat. If you have need for a boost, visit arena workshop when opportunity presents itself, do it right now. Push the specified button to see what is on offer at arena workshop now. Buy salvia potion to restore your health it is free of charge this time. You have raised the level of your character! Dispense the available skill-points to improve his live performance. You can activate fire and blade traps with a switch. Remember, Gladiator, you are here to entertain! Get your glory indicator to fill all the way to red level to receive a bigger reward! If you knock your opponent against the door or window where you see gladiators waiting they will grab and hold him allowing you to land blows unopposed. You cannot take any weapon or shield that you pick up during combat away from arena. However all your weapons and shields will be repaired for you after combat. Have you been defeated not a problem! Bribe the senator and proceed to the next combat. You may consider using "Bribe" Option if you want to keep completed laurel challenges in a fight that wen badly. To dodge from the lion's attack hold the block button with one finger and slide another one to the knight or to the left.